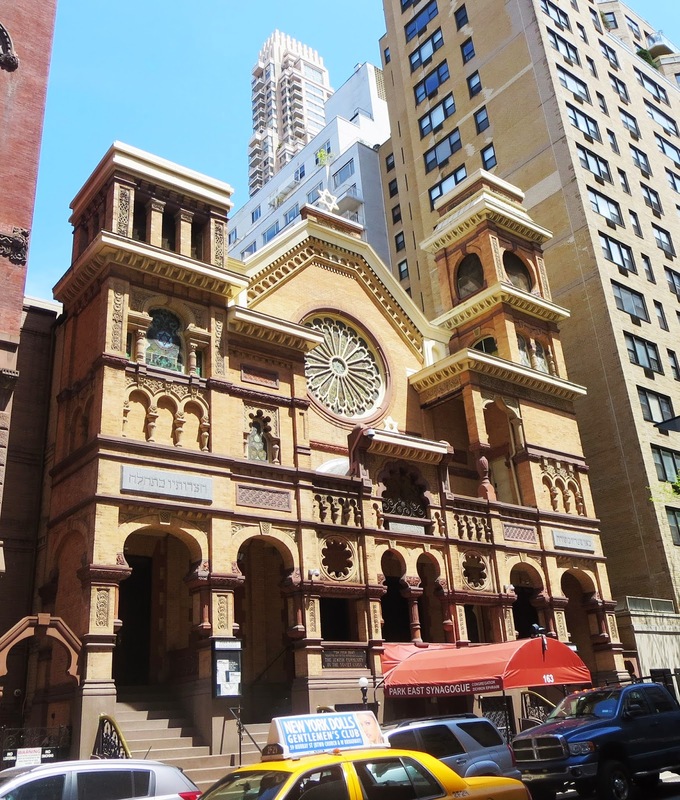 In 1890, the Orthodox synagogue at East 67, designed by German-born architects Ernst Schneider and Henry Herter, opened its doors. Over the door way engraved in granite and written in Hebrew is a verse from Psalm 100. "Enter into His Gates with Thanksgiving and into His courts with praise." 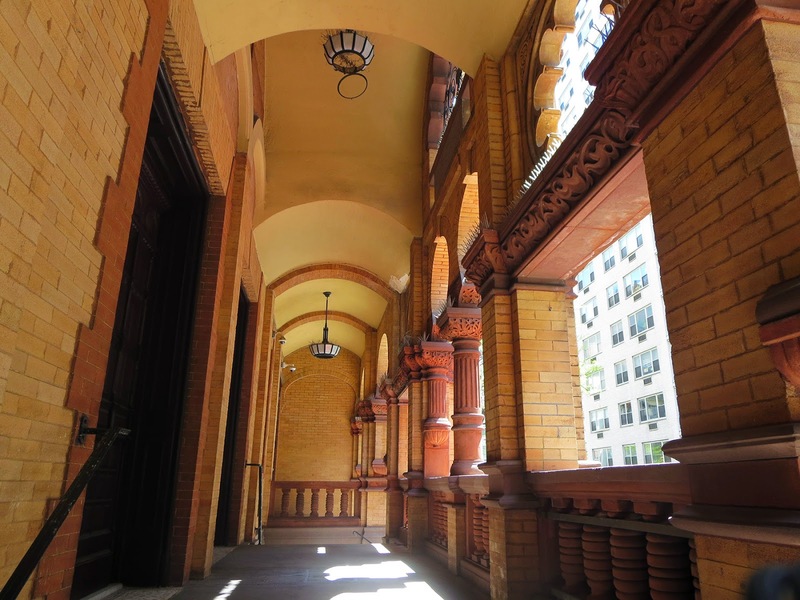 The orange-brick and terra-cotta Moorish Revival building has a magnificent rose window and bulbous cupolas set at different levels. Moorish architecture is a variation of Islamic architecture. It is named after the Moors, North African people who conquered the Iberian Peninsula in the 700s. The Moors controlled what is now Spain, Portugal, and the Pyrenees region of France for hundreds of years. The Moorish style evoked a high point in Jewish life in 11th century Spain when Jews, Christians and Muslims lived peaceably together. It was a time when Jewish intellectual and spiritual life flourished. So it is not a surprise that a lot of synagogues all over the world were built in the Moorish Revival Style. Since 1962, the synagogue's rabbi has been Arthur Schneier. Rabbi was born in Vienna in 1930. His family fled in November 1938 from Vienna to Budapest, where Arthur survived the Holocaust in the Budapest ghetto. In 1947 he moved to the United States. Schneier became a Rabbi and was awarded an honorary doctorate in theology at Yeshiva University in New York City. To protest religious repression in the Soviet Union, Rabbi Schneier recruited a group of civil rights leaders, politicians and members of the clergy for an Appeal of Conscience rally. 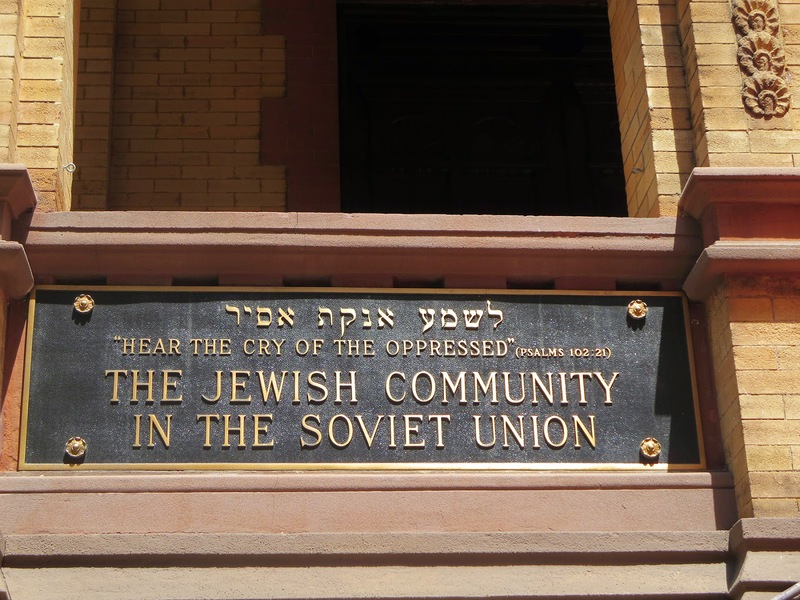 On the synagogue balcony across the street from the Soviet mission to the United Nations, Rabbi Schneier displayed a bronze plaque, inscribed in English and Hebrew with the biblical phrase, ''Hear the cry of the oppressed. The Jewish community of the Soviet Union '' . I wrote about the Soviet Mission building at the corner of East 67 and Park Avenue in one of my posts. 23 years later, in 1988, rabbi Schneier said that New York Jews should greet Gorbachev respectfully ''in recognition of the increased opportunity for Jews in the Soviet Union to emigrate and practice their religion and their culture at home.'' The same year Rabbi visited Moscow, Russia where he met with Soviet officials about religious rights. 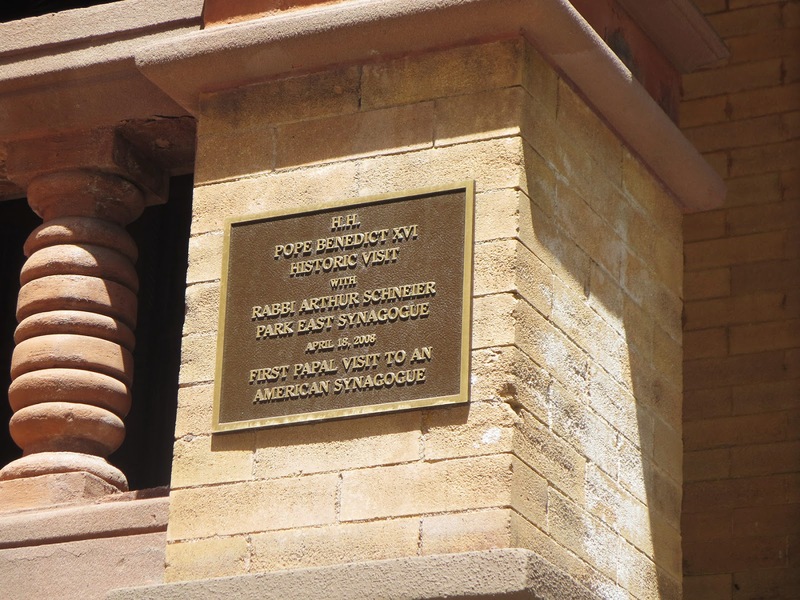 Twenty years later, in April 2008, Pope Benedict XVI paid a 22-minute visit to the Park East Synagogue — the first papal trip to a United States synagogue. He presented the synagogue with a replica of a medieval Jewish manuscript from the Vatican library and received three gifts: a seder plate, a Passover haggadah and a box of matzo. The visit was only the third known visit by a pope to any synagogue. 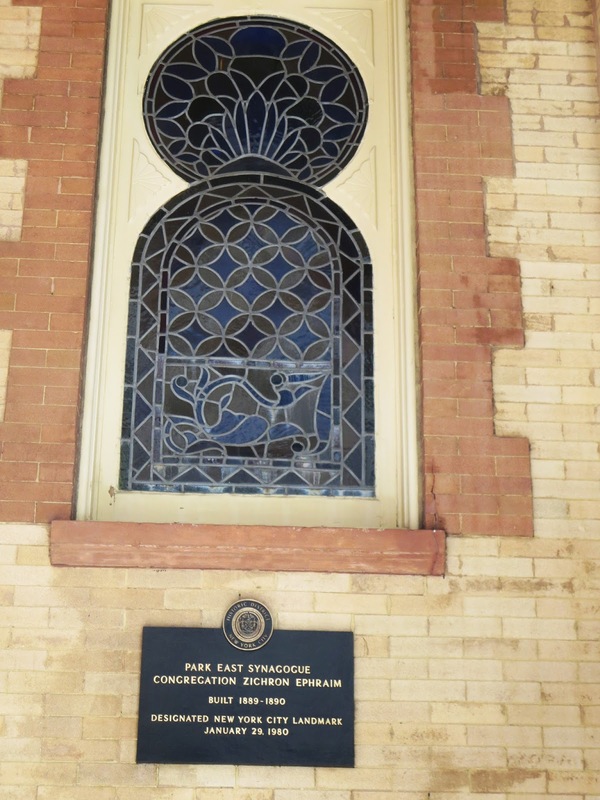 There is also a plaque on the wall of the building memorizing this event. There is Early Childhood Center and Lower School, grades kindergarten through grade five at the synagogue. There is also a Sunday Shkola that educate Russian Jewish children about their heritage.